Report for Optima Community Association. Through workshops with a local play project and a temporary intervention, the report aimed to find how attention to lighting and colour could change the psychology of the area, whilst involving residents in decision making. It also aimed to investigate how some of the city's policies and guidelines could be tailored to this city centre residential area. Focusing on small changes rather than larger typical art 'statements', the work aimed to find better ways of responding to and identifying certain needs of residents. 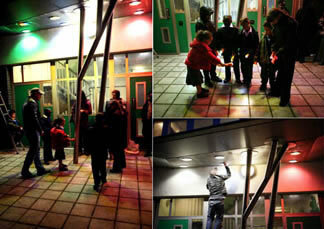 When opportunities to work with existing features and utilities arise (in this case the entrance canopy lighting as an example) a supportive and interconnected approach integrating artists throughout the regeneration process, could see incremental changes across the area developing it holistically over time.